Beginning around Sunday, anglers can take advantage of one of the better night bites this summer in statewide lakes. The amount of sunlight we see being cast on the moon has been stretching, and on Monday, the moon will be a full glow. Fill up a Thermos with piping hot coffee and make it a late one. Feel like targeting high country trout? The following lakes will have just been stocked: Bear Canyon, Show Low Lake, Willow Springs, and Woods Canyon. Also, native Apache trout have just been dumped into the east and west forks of the Black River, Little Colorado River, Sheeps Crossing, and Silver Creek. Chasing a bass bite? There's a decent top-water bite at Bartlett and Roosevelt, where shad schools reportedly are growing. Make sure there's bait in the area, and don't stay in a spot too long. If there are fish on your finder and they're not biting after 10 minutes, move on. There's too much bait in lakes such as Bartlett to be missing out on a potential bite window. For catfish, it's prime time for fishing at night from a shore or boat. Channel catfish are a robust fishing resource, excellent fighters and superb table fare. Remember that in pine country, as cumulonimbus clouds form, the barometer drops and flying insects begin to frantically skirt the ground and water. "Match the hatch" - find out what the fish are naturally feeding on, and match the foragers. Spin and fly anglers can use flies such as wooly buggers when fish are feeding actively on insects. With a spin rod, that means using a casting float and running a small leader to a fly. Last week's reports from anglers: Fishing on Lynx Lake is poor; Red Mountain Lake in Mesa on Tuesday was good for top-feeding bass following rains. Crawdads were enticing bass and stinkbaits and crawdads were drawing catfish to the hook; Ashurst Lake was slow on Wednesday, one angler reported, in cool, cloudy, light sprinkling morning conditions (5-11 a.m.) - rooster tails, spoons, garlic Power Bait, jigs and flies with small bobbers tied off at about three feet weren't getting bites. But as the angler continued: "Tomorrow is another day." Be persistent, target all areas of the water column, change spots frequently, and have fun. By the way, I'm on Twitter. Follow me at @NickFishAZ for fishing reports, up-to-the-second news, tips and more. Any questions likely can't be answered immediately, but could be answered and featured in the 'Q&A' section of this report. Welcome to the future of fishing information. Good luck on the water! 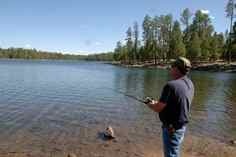 As usual, you can send your fishing reports, photos and questions to BFishing@AZGFD.gov. And don't forget to check out our Fish & Boat Arizona map before planning your trips.